Melatonin is a natural hormone that is produced by the pineal gland in the brain and is only released at night. It's sometimes called the ‘hormone of darkness’. It's controlled by the 24-hour circadian clock, and its release tells the brain that it is nighttime. In day-active animals like humans, melatonin ‘opens the sleep gate’ and tells the brain that it’s time to sleep. We usually start to produce melatonin about 2-3 hours before we go to sleep. Melatonin can also be purchased in pill form, which contain a synthetic version of the hormone but in a much higher dose than we naturally produce. Melatonin can help you shift to new time zones even faster. How does melatonin help me reduce jet lag? Taking melatonin will do two things: First, it will help shift the timing of the body clock to help you overcome jet lag more quickly. Second, it will help you sleep when you are transitioning between time zones by telling the brain to sleep at a different time than normal. Melatonin is not a sleeping pill, however, and will not help sleep once your jet lag is gone. Melatonin is a relatively safe supplement when used in the short-term, and melatonin side effects are uncommon. Melatonin safety in the long-term has NOT been determined in randomized, controlled studies. You may NOT be able to use melatonin if you have certain medical conditions. Do NOT use melatonin without medical advice. There are NO data on how melatonin interacts with other drugs. Do NOT use melatonin if you are pregnant, lactating, have epilepsy or migraines, taking warfarin, or if you have a personal or family history of psychiatric disorders. AVOID alcohol and tasks requiring a high level of alertness, such as driving or operating machinery, within 8 hours after taking melatonin. Try melatonin at home or in a safe environment BEFORE using it on your first trip. Do NOT take melatonin for the first time on the plane. Do NOT give melatonin to children. Before using a specific melatonin product, make sure to ask your doctor about its safety, side effects, interactions, and warnings. If you experience side effects after taking melatonin, you must consult your doctor. Taking melatonin at the right time can help you shift more quickly to a new time zone, but the right light exposure at the right time is even more effective if you are trying to eliminate jet lag. 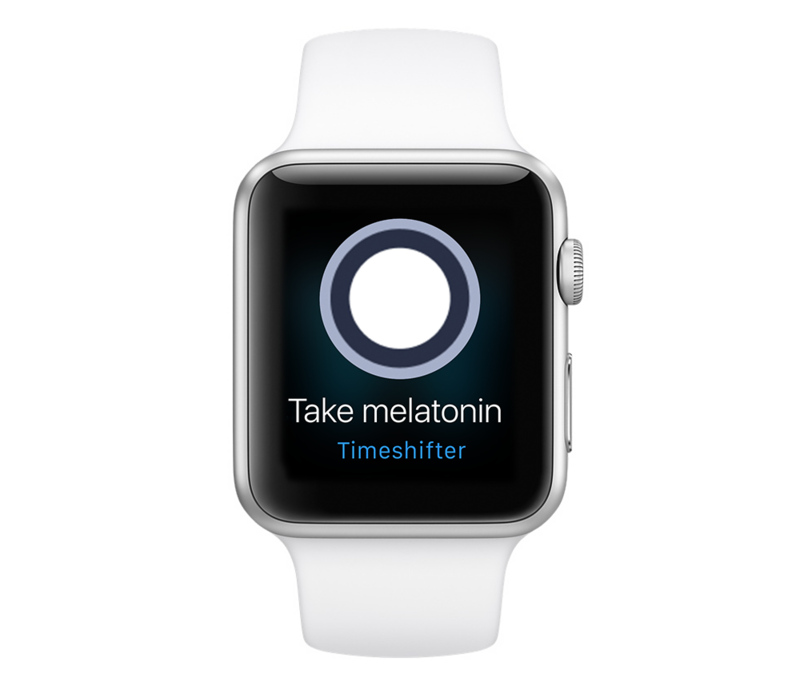 The Timeshifter jet lag app will give you all the advice you need when crossing time zones, including when to use melatonin during your trips to get the maximum benefits. Arendt J. (1994) Melatonin and the Mammalian Pineal Gland. ISBN 0-412-53600-5, Chapman Hall, 2-6 Boundary Row, London. Arendt J. (1996) Melatonin. British Medical Journal, 312: 1242-1243. Arendt J. (1997) Safety of melatonin in long term use(?) Journal of Biological Rhythms, 12: 673-682. Arendt J, Aldhous M, English J, Marks V, Arendt JH, Marks M, Folkard S. (1987) Some effects of jet lag and their alleviation by melatonin. Ergonomics, 30: 1379-1393. Arendt J, Aldhous M, Marks V. (1986) Alleviation of jet-lag by melatonin: preliminary results of controlled double-blind trial. British Medical Journal, 292: 1170. Arendt J, Skene DJ, Middleton B, Lockley SW, Deacon S. (1997) Efficacy of melatonin treatment in jet lag, shift work and blindness. Journal of Biological Rhythms, 12: 604-618. Folkard S, Arendt J, Clark M. (1993) Can melatonin improve shift workers' tolerance of the night shift? Some preliminary findings. Chronobiology International, 10: 315-320. Haimov I, Laudon M, Zisapel N, Souroujon M. Nof D, Shlitner A, Herer P, Tzischinsky 0, Lavie P. (1994) Sleep disorders and melatonin rhythms in elderly people. British Medical Journal, 309: 167. Herxheimer A, Petrie KJ. Melatonin for the prevention and treatment of jet lag. Cochrane Database Systematic Review, (2002) Issue 2. Art. No. : CD001520. DOI: 10.1002/14651858.CD001520.